You have just returned from the expedition to Namibia and Botswana. What have you done there and what are your impressions? The expedition is a kind of continuation of the project of the Vanishing Cultures, which we are preparing together with Katja Bidovec. We are trying to document the cultures who are disappearing, using a special approach, namely the studio photography. This is a project that is continuously in progress, because countless cultures disappear on a daily basis. The first part of the project can already be seen at the Ljubljana Castle. The photo exhibition will be on open until September 24, 2017. Studio photography requires a lot of equipment and special preparation. How to set up a real photo studio in the field? It's true. Studio photography is an extremely complicated thing. Look at how much equipment we carry (shows up on a pile of luggage). On trips, we wear 3 T-shirts, which we wash all over again, and everything else is photographic equipment that we transport to the most remote parts of the world. The biggest challenge is to set up a real photo studio in such remote places. Everybody can travel to a foreign country, meet people along the way, or in a village, and photograph them. However, setting up a real photo studio in such distant places is truly a special challenge. 1Arne Hodalič kindly shared with us the freshest impressions from his trip. Such journey certainly brings many challenges. Did you encounter any unpredictable situations on your way? I must say that this expedition to Botswana and Namibia was one of the best adventures in my career, as we were challenged by extremely difficult conditions on the road. Driving off-road can sometimes be quite risky. There was four of us; Mare and Ksenija Lakovič, who were there for the third time, and me and Katja. 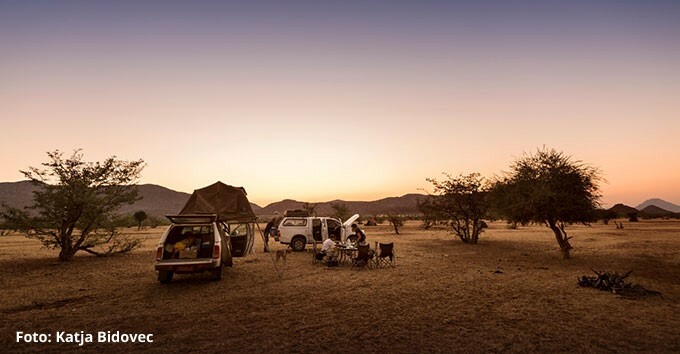 We rented two jeeps for four people for safety, carrying with us spare tires, additional gas supplies, additional water supplies, ... We passed the notorious Van Zyls pass, where we should not even go ... Those who rent off-road vehicles in Namibia, prohibit this specific route. Even car insurance does not apply there because it is too risky. We drove along the northern Namibian border in the Marienfluss area near the Angolan border. These are the places where very few people travel. There are no souls living hundreds of miles around ... But we managed to photograph a very rare culture, who mostly live in Angola, the ethnic group Hakaone. We took some really good photos. We are glad that we have documented three cultures on this journey; the Himbe, the Bushman and the Hakaone. To photograph the Himbe culture in their natural environment, in the Marienfluss area, is quite different. They say that each journey makes us different, that each trip changes us a little. Did any travel leave a permanent mark on you too? That was certainly India. It's the hardest, most diverse country. I've been returning to India once or twice a year since 1988. Traveling and taking pictures in India is a special experience. Last year, when we set out to photograph in India, we traveled with GoOpti too! Let me say that we are always very satisfied with GoOpti and we use it on all travels when the starting airport is a little farther away. The lens of the camera has the power to look into the background of a person, through all the masks and facades, so some do not even like to be photographed. Of course :) How is it like in countries around the world? Where do people dislike to be photographed and where are they eager to pose in front of the camera? The more Muslim oriented is the country, the less eager are people to be photographed, especially women. In Oman or Yemen, it is not allowed for a man to photograph a woman. If you do so, you can sometimes expect them to start throwing stones ... All the photos of women from Yemen were taken by Katja. Morocco can also be difficult. It was also difficult to take photos in Pakistani hills and in some places in China. In South America, however, it is highly dependent on the state. On the other hand, India is the most open. That's why I enjoy visiting that place so much. There you can easily photograph men, women, or even some factories, where authorities here would never allow you to enter, let alone take photographs. Africa is also a country where photos are easily taken. You know, it is not so much important, if people like to be photographed as it is important if people do not mind to be photographed. If they (usually children) like to pose in front of the camera, shouting: ‘photo, photo, …’ and immediately afterwards; ‘money, money ...’ you do not have the opportunity to do what you want. In India, for example, you take a picture of a woman washing clothes. She notices you and looks at you, but then she doesn’t pay attention anymore and you continue your work. In this way you can catch much more genuine moments. 2The expedition was a continuation of the project 'Vanishing Cultures', prepared by Arne Hodalič and Katja Bidovec. Three. One Slovenian and one Italian, since I have also the Italian citizenship plus one for business purposes. Yes, this is almost necessary if you want to travel through such different countries. What would you recommend to a traveler who wants to make a good travel photo? To join my photo workshop (laughs). Good photos are made by good photographers. I'm not saying that you cannot make good photos with your phone. Of course it is possible, but you need to have a lot of knowledge, know the benefits of the phone, to which things you have to pay attention ... People think that better equipment also means better photos, but this is a misconception. I'm sure that the only key to success is photographic knowledge ... Good travel photos do not come out on a travel journey. You must be able to take a good shot here first in order to make good photos on a trip. An exotic location, by itself, does not bring good photos. Thank you, Arne and Katja, for sharing your experiences with us. We are pleased to be able to participate in such noble projects as the Vanishing Cultures and we strongly recommend to all our passengers to visit Ljubljana, and see the photo exhibition at the Ljubljana Castle. Are you also planning to go on an exciting trip? Take care of your airport transfer ASAP.